But still, this sequel looks like it will be bigger and better in every single respect, and will also feature a new hacker protagonist named Marcus Holloway. 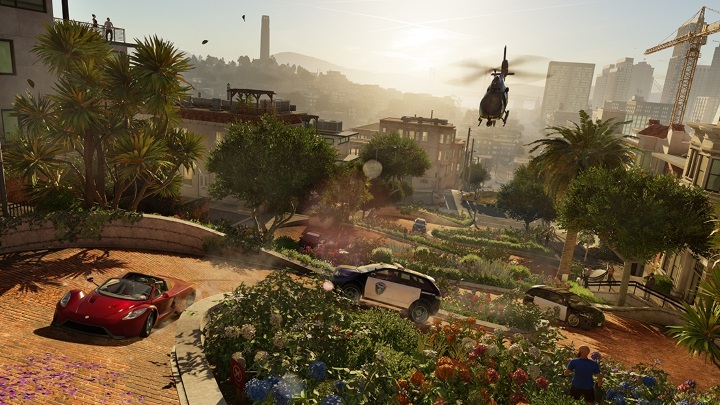 The game will also be set in the US city of San Francisco, with the iconic Golden Gate Bridge appearing prominently in the trailer, while other well-known locations like Chinatown and Alcatraz are also seen. Aside from the game’s improved parkour (the trailer shows Holloway and his pals running on rooftops like in an Assassin’s Creed game), the game will also feature improved hacking. Actually, this was a big feature of the original Watch Dogs game which came out in 2014, but hacking has been expanded in this sequel allowing players to hack any device or person on San Francisco’s streets, even taking control of cranes and drones for instance. Also, according to Ubisoft’s official description players will be able to “infiltrate the cutting-edge offices of Silicon Valley companies” and the game’s open world features “many secrets to uncover in the birthplace of the tech revolution”. What is clear though, is that Watch Dogs 2 certainly looks promising judging by this reveal trailer, and if Ubisoft’s upcoming video game manages to improve on the 2014 original, then Watch Dogs 2 could surely end up being one of the top video game releases of the year when it ships this fall.